This report is a representation of the major activities and achievements in the College of Agricultural and Environmental Science (CAES) covering the academic year 2014/2015. The report covers the strategic areas as outlined in the University strategic areas and events within the prescribed period. It covers the academic profiles including student enrollment and registration, student graduation and new programs. The report also outlines innovations in teaching and research, resource mobilization and collaborative efforts. You will also find sections on knowledge sharing and transfer to society, human resource and capacity building efforts and publications. The European Union (EU) in collaboration with Makerere University and RUFORUM hosted the EU Ambassador H.E. Mr. Kristian Schmidt. This event served to debrief the university about Erasmus Mundus Programme Scholarships for students & academics and also to profile and market the European Union support to Makerere University. Read more. The University won a grant from African Caribbean and Pacific-European Union Co-operation Program in Higher Education (EDULINK II) to implement a regional PhD programme ARI in collaboration with a similar European –based PhD program AgTraIn. 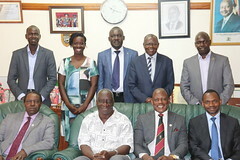 The partners of the project entitled, ―Strengthening Human Resource Capacity to Foster Agricultural and Rural Innovations in Eastern Africa‖, include Egerton University in Kenya and Sokoine University of Agriculture in Tanzania, Wageningen University of Netherlands, Agreenium in France, University of Copenhagen in Denmark and the Regional Universities Forum for Capacity Building in Agriculture (RUFORUM). Several staff from CAES were winners of the 6th RUFORUM Grants totaling to USD $ 600,000. 119 proposals were submitted from various RUFORUM member Universities for the 6th GRG proposal call. 29 were selected for the award. Out of the 29 proposals, 10 (about 30%) are from Makerere University and most of the PIs are in CAES. The 10 PIs are Dr. John.Steven Tenywa, Assoc. Prof. Donald R. Kugonza, Dr. Thomas. Odong, Dr. Jackline. Bonabana, Dr. Robinson. Odong, Dr. Grace Nakabonge, Dr. Justine Namaalwa Jjumba, F. Tulinayo, A. Akol and Prof. Noble Banadda. Read more. Click here to download the full Annual Report.